I had originally called the post “Waiting for Mariel” as I did exactly that when work brought me to Singapore this week. And it was also exactly a year since Mariel had unexpectedly asked that we go on an impromptu holiday trip to the “Lion City” for Sam’s 9th birthday. My trip this time however was one I had found very difficult to make. Because I know it will surely bring back an avalanche of memories. So while I had tried to focus on preparing for some needed business meetings there, I just can’t help but see Mariel, Sam and me strolling down the same Orchard Road and browsing through those ref magnets at Bugis. Now I appreciate even more why Mariel had wanted so much to spend more time with us then. She was literally trying to cram every bit of memory she could get because time was not on her side. I remember too how she was not even interested in shopping even while being in the midst of the so-called Great Singapore Sale. She was busy instead planning for the little tour to Sentosa which should give us more bonding experiences. We took that hair-raising ride on the Cable Car with its glass-bottom cabin, hobnobbed with celebrity fishes at Underwater World and even got our family photo taken at 100 meters above the trees at Siloso Beach. It’s the vacation trip that will forever be etched in my mind. And I now return for the first time to the same memorable places to remember and thank Mariel for the wonderful life she had shared with us. 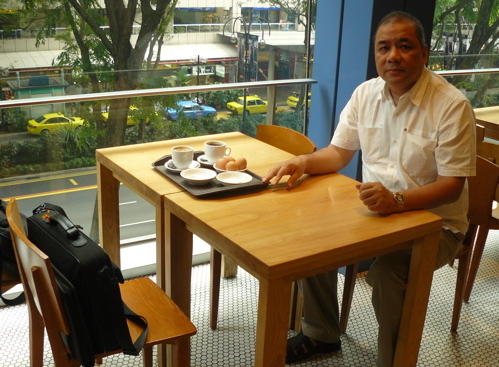 While there I also decided on a lark to grab some breakfast at the “Toast Box” at Wisma Atria. It just happened that the only available table at this place was the one I had shared with Mariel a year ago. For a few moments I had gone back in time leisurely drinking coffee with her and Sam and still being a family. Of course now I just have to be content to nibble on these tiny bits of memories being somewhat afraid they could run out someday. It was one of the “longest” breakfast I had taken in my life too. At the airport, I had instinctively dialed Mariel’s number on my mobile phone because I had come across something “remarkable” during the trip. It took a second later before I had realized that she was no longer there to take the call. That she was no longer there to share my “excitement” and that things will never be the same again. I miss her so much. And I just continue to thank her for giving me the best times of my life’s and its happiest memories that I now treasure forever. I love you Mommy, good night. Life can seem very lonely when you’re at home, and sometimes even lonelier when you’re away. How you long to share those moments, or to go back in time to visit the trip you made before. If only we could make that happen for you, we surely would. I’m sorry. Thank you Robert, sometimes the longing just gets into you. I just try to pray and send Mariel my love each time. Ah, I know that feeling. Dialing the number and then catching yourself. I’ve done that. Takes your breath away. Hang in there. Sorry, I missed this post originally. If only there were a phone line to Heaven – we’d all be standing in line to use it. But do you know, I think the reason there isn’t one, is because we don’t need it. Just tell Mariel everything you want her to know – I believe she can hear you. Thanks for the words of comfort Writinggb. We both know the great void left behind by those we love. And I have to remind myself from time to time that I don’t even need to dial now to reach Mariel. Because more than ever we are now always “connected”. She is there where my thoughts are. Jan, I really hold on to this thought that she is never really further than a heartbeat away. Thanks again for visiting. God bless you.